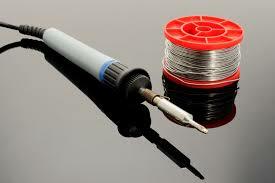 Soldering Procedure is a technique used in Electronic Circuit to join two wires or two components permanently. The metal used for Soldering are usually having a Low Melting Point. These are the common metal used for Soldering. Switch on the Soldering Iron and keep it firmly in the stand. It takes some to get started. After doing this move on to Step 2. Analyze the number of components involved in the circuit. Check whether you need a PCB (Printed Circuit Board) or not? For smaller Circuits, Printed Circuit Board is not necessary. Printed Circuit board can be cut depending on the Circuit Size. Use the electronics Knife and scratch the terminals of the components. Don’t over scratch the terminals. Bend the components so that it can be fixed firmly on the Printed Circuit Board. The terminals should be smeared with Flux. Draw a layout diagram (Use any software or simply draw it in a piece of paper). It’s time for the Soldering Work. Take the Soldering iron in one hand and the soldering lead in another hand. Dip the soldering iron in a flux and make it contact with the Component terminal and Soldering Lead. Allow them to cool for sometime. 5 minutes of cooling is enough. Use the Multimeter and check the continuity of each and every joints. While handling the Soldering Iron, never touch the iron portion. Even after removing from the plug, the heat would remain there for few minutes. Stay safe when you are using an electronic knife. Note: If you are not having the following components, just use any resistors which you are having.